I still got my 97 f 150 scab for now going to sell it when the right person comes along . Damn this 04 drives like a dream. Everywhere I go ppl come up to look at it. Sure draws lots of attention. Assateague bound - with a busted knee! Just got my Linex and love it! Wheres the pics? Keep the BLAZING YELLOW alive! here's mine My truck !!! Love the yellow! too bad you cant get one anymore! I'm bummed. I am leasing my Yellow Scab, and have to turn it in next February. I was hoping yellow would be an option for my next truck. 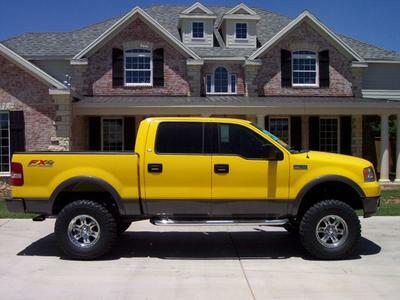 I did notice a yellow F-250 at the dealer yesterday-too much truck for my needs. Anyway, does anyone know if it will be an option for 2006? As far as I know, Blazing Yellow is not an option on the '06. That's why I just orderd a white one, that way I can change it later if I really want to. I would have loved to get a yellow one. Keep the thread going theres gotta be more of us Yellows out there, my favorite pic is in my sig. Still have mine...just turned over 9,500 miles in 13 months.